It’s not often one comes across a fine sweep of ancient whiskies from Islay, let alone have them arrive unbidden on the doormat like some offering in the Wicker Man. What curious trick was this? Nothing, it seems, more than the fact that Scott Laing of Hunter Laing had a few open bottles and thought it’d be nice to share them. Indeed, it was lovely. 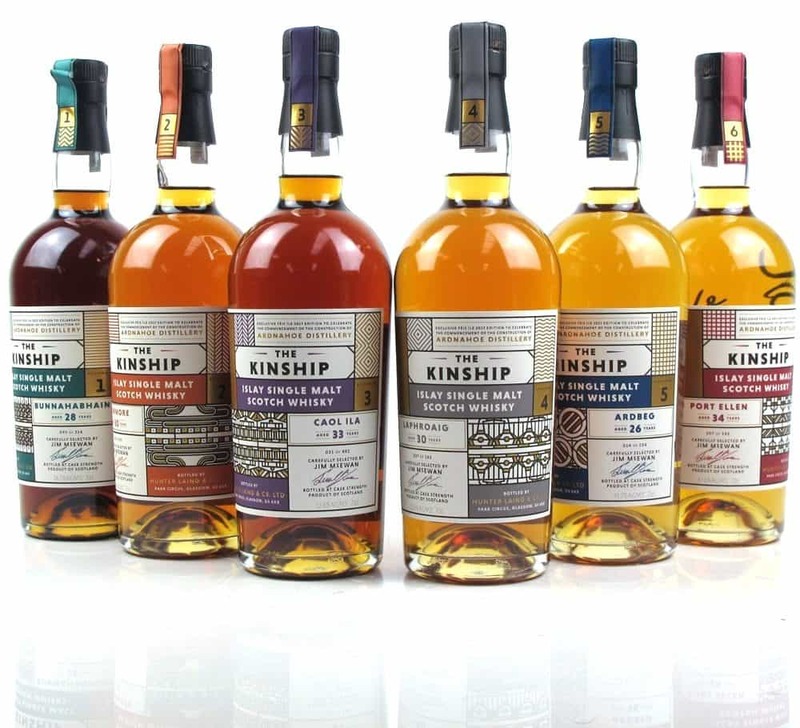 So today I have six of them, in their twenties and thirties, including a legendary closed distillery. 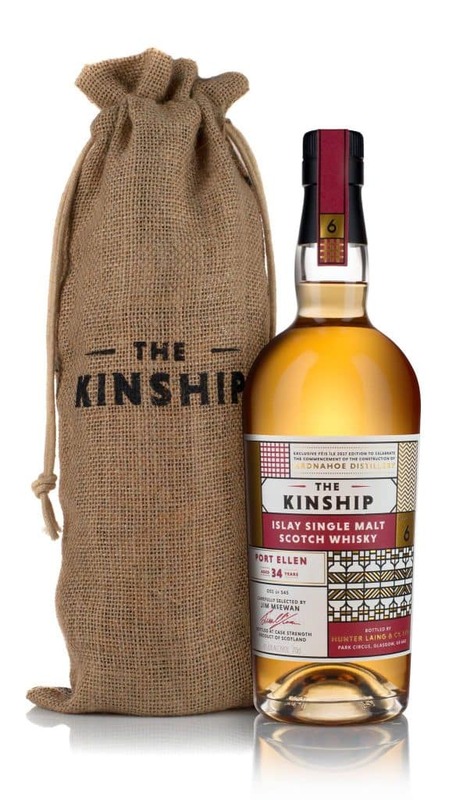 The new Kinship range, from Hunter Laing, was released to celebrate this year’s Feis Ile – the Islay Festival of Music and Malt. Why would they be releasing this? 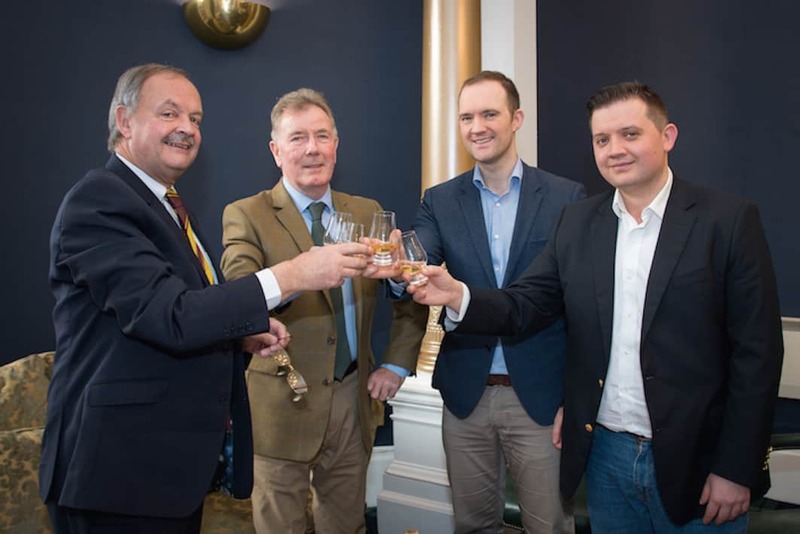 Because the chaps at Hunter Laing are building a shiny new distillery on Islay, Ardnahoe distillery – so they wanted to release some decent Islay single malts to mark the beginning of construction work. 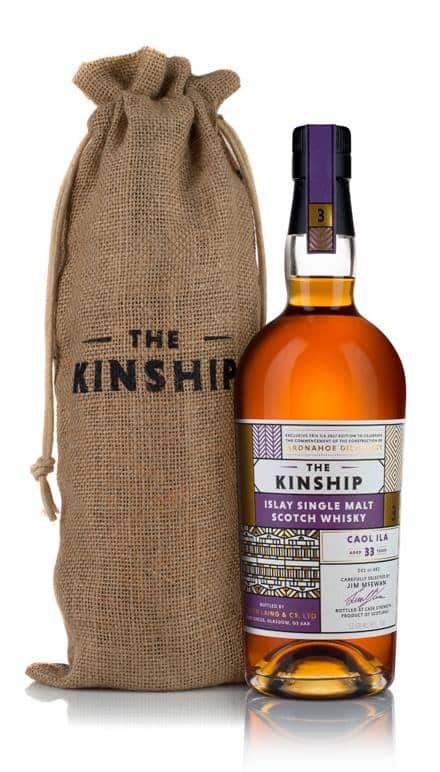 The Kinship range comprises of a 34 year-old Sherry cask Port Ellen (which costs £1,800); a 33 year-old Sherry cask Caol Ila (£375); a 30 year-old Sherry cask Bowmore (£495); a 30 year-old Bourbon cask Laphroaig (£720); a 28 year-old Sherry cask Bunnahabhain (£310); and a 26 year-old Bourbon cask Ardbeg (£720). The bottlings were selected by Jim McEwan, who comes out of retirement from his time at Bruichladdich to be in charge of production at the new site. One of his first really difficult jobs, I’m sure, was to raid the Hunter Laing warehouses to bring out some very old Islay whiskies. I very much doubt he was struggling to find something flavoursome selecting from these venerable old things, from the aged stocks one of the best independent bottlers around. I suspect that an anosmiac with a cold could do rather well in that situation, and with that brief. Anyway, let’s get to the whiskies themselves. 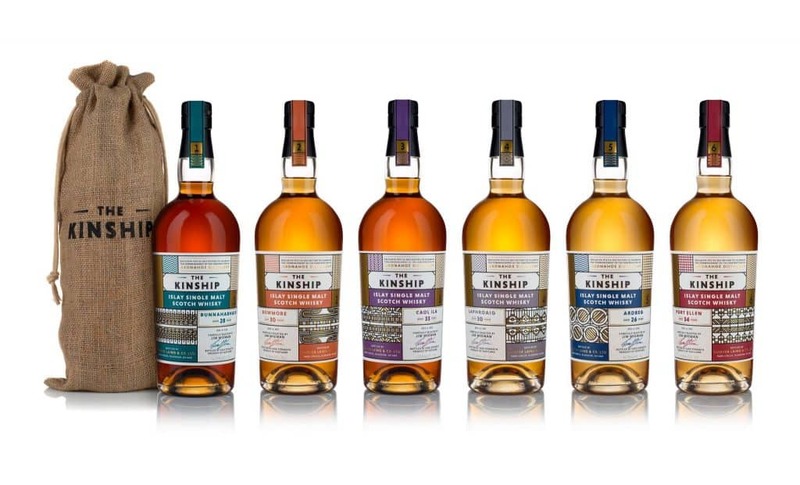 Six old Islay malts, ranging in price from £375 to £1800, and available at Hunter Laing’s new shop at Islay House Square – although they’re popping up at auction too, as with most other hard-to-find whiskies. On the nose: oh my. The harmony between the bright redcurrant, cranberry and blackcurrant notes, and the mellow peat, is gorgeous. Drifts into BBQ meat territory, that sticky sauce glaze. Very gamey, grouse breast simmering away. Balsamic vinegar. Suddenly, right at the end: bright perfumed notes, with violets. In the mouth: quite a lot of peat for a Caol Ila of this age – it’s so vibrant and energetic, not at all mellow as one might expect. Tart with a thin texture. Warm ginger. Stacks of dried fruits – raisins, sultans – above what becomes an ashier peat rather than sweet. Right at the end: citrus, with the wood tannins kicking in. Superb balance. Lively indeed, and astonishingly entertaining. A Keith Richards of a dram. My favourite of the lot – quite a reasonable price in this age. Absolutely worth the entry fee. On the nose: unusual: soft, sweet, very mellow. Lime cordial, coconut, jasmine. Vanilla notes, then floral honey. Oily and resinous. Herbal too, with touches of mint. Minimal peat, but it’s there: ashes in an old fire, long gone out. 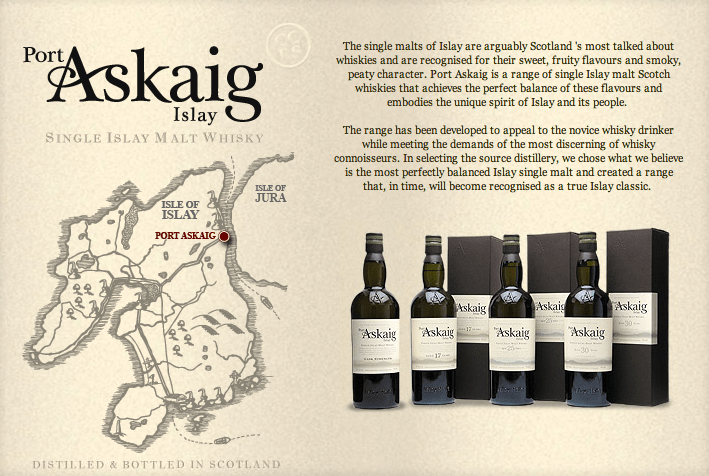 In the mouth: the peat remains minimal, but there’s enough ashiness. Sunflower oil, slightly mealy: Malted Milk biscuits. Peat becomes warmth over time. Herbal and mossy, seaweed notes coming to the fore, and it really is a mixture of that coastal, herbal, malty, mossy combination with the peat where this whisky dwells. Time brings apricots, apple peel, some slight tangerine note. Citrus at the end. A really lovely, lovely whisky. Two for two. On the nose: again, unusual, but excellent. Oily, with golden syrup sponge cake, raspberry jam, orange peel and cloves. Echoes of peat come through, cigarette smoke and Lapsang Souchong. Medicinal, drifting into (very) old Laphroaig 10 territory. Jam tarts, heavy on the pastry. In the mouth: thin to medium texture, though silky enough. More peat present than the nose, though this doesn’t like to open up even to taste. Tobacco and port, blackcurrants, tannic Cabernet Sauvignon. Dry and ashy peat. Rosemary. Just a little soapy in places. Among the least likeable of the bunch (but then it is Bowmore, the most boring of the island’s distilleries). It’s still pleasant though. On the nose: at this crazy high strength, the flavours are as tight as a badger’s arse. Mossy and vegetal, a peat that is very much the dirty earthy type, rather than sweet or ashy. Water does huge favours, liberating sweeter smoke, baked pears and golden syrup. In the mouth: again, just like the nose on flavours until water is added. Tight and earthy, with touches of fennel and peppermint leading to dirty grass. With water: hot chilli heat, bitter wood; apples, simple vanilla. Musty with Lincolnshire Sausages and cloves. This simply confirms to me that people who love and collect Port Ellen are, and always were, a few sandwiches short of a picnic. Colour: burnt umber. Very dark! On the nose: my kind of whisky. Shoe polish on leather. Elderberries, dried prunes. Raisins. Some really deep notes here. Slightly nutty and, given time, it opens up to some Christmas orange, cloves and cranberries. In the mouth: sticky and tart, with elderberries, raisins and blackcurrants dominating. Bitter dark chocolate. HP Sauce. Burnt meats smothered in onion chutney. Jammy, maybe even molasses, yet quite dry in the mouth – plenty of tannins showing, with cloves and ginger towards the finish. Perhaps a little too long in the tooth, but really an intense and guilty pleasure. Colour: yellow gold. Second-fill cask? On the nose: sharp, tangy, coastal. Plenty of brine and citrus, with vanilla to follow. Peat is the mild, dusty coal ash kind. Touches of sage. Tangerines. Plenty of vegetative, earthy mossy aromas. In the mouth: there’s the peat. Assertive, sweet and laced with vanilla. The coal dust notes follow. A little musty, slightly yeasty too with boiled ham. Hops and floral honey. I wouldn’t say the texture is all that: rather thin, but although this is simple (we’re talking single casks, not layered single malts), it’s a very old-school Ardbeg indeed. One can see some of those amazing pre-ressurection style Ardbegs in this. Though I’m not sure as a stand-alone it’s in the same league. Fabulously fun range of whiskies. There is a lacuna, however, in the shape of Bruichladdich – Jim’s former distillery. One can’t help but wonder why there was no Bruichladdich in the series, and it’s most certainly a conscious omission here. Anyway, I can’t remember a more entertaining, varied, and complex range of whiskies, not in a long while. Yes, they’re expensive, and hard to get hold of even if you did have the cash, but they’re old and, in Port Ellen’s case, rare, and that’s the nature of the game these days. Although that said, the Port Ellen – as is so often the case with this distillery – was as disappointing as a wayward child. That distillery closed for good reason. The Caol Ila was brilliant – that’s where your money should be going. Thanks to Scott Laing for whisking these over to me – very much a delightful surprise! Top image on the website via Whisky Auctioneer.